For additional pictures with a look from above of every M-29 wedge club, please visit our Facebook page. You can customize your lengths, lofts, lies, swing weight, shaft selection and grips in the pricing section. * All lofts and lies adjusted to spec. ** Head weights can be adjusted heavier up to 12g per head through the hosel weight port. 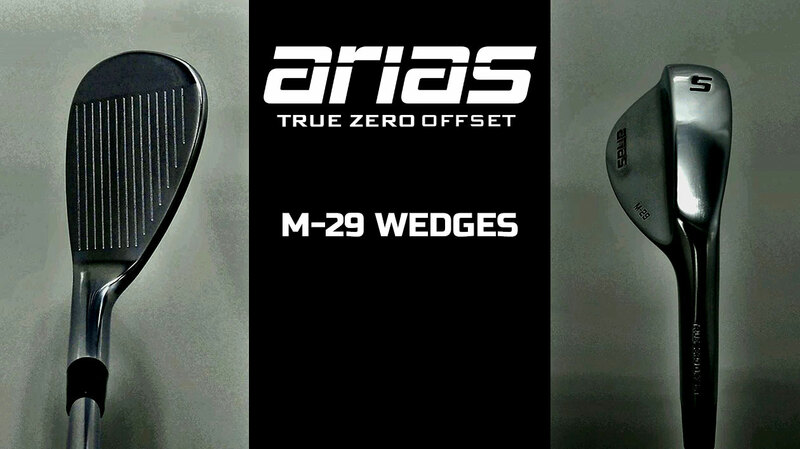 *** Both our D-23 irons and M-29 wedges can be bent up to 4°, however only by arias golf under warranty. Available in both 355" taper tip and parallel 370". Onset on all three wedges. Head weights match the D-23 irons, golfers who play their wedges at full swing will enjoy how their distance gaping performs in relation to the rest of the D-23 irons, yet heavier swing weights can be achieved easily by adding tungsten weight in the hosel weight ports if needed. Blade length closely matches the D-23 irons. Rounder toe on all three wedges begs you to open the blade up when the situation calls for it. Even the gap wedge can be played naturally from the bunker on those longer shots that require less loft. Sand wedge has more bounce to help in the fluffy sand and thick rough while the lob wedge has a lower bounce so you can easily open the blade up on a tight lie and play any type of finesse shots. Plenty of room to add your own custom stamping if wanted.